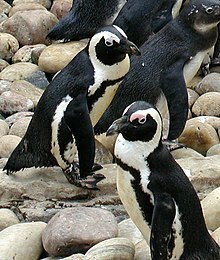 The African Penguin (Spheniscus demersus), kent forbye as the Jackass Penguin (efter his cuddie-lik braying caw), is fand on the sooth-wastern strand o Africae, bidin in colonies on 24 islands aqueesh Namibie an Algoa Bay, naur Port Elizabeth, Sooth Africae. Wikimedia Commons haes media relatit tae Spheniscus demersus. This page wis last eeditit on 28 Dizember 2018, at 12:27.